The temperatures are climbing, water parks are getting increasingly more crowded, and the pool is getting a little old. This is usually what happens around this time of year when the excitement of summer vacation and warmer weather begins to wear off and the reality of the summer heat sets in. The best option? Move indoors! If you’re looking for the best indoor summer activity, we’ve got one for you. While we love the outdoors and think it’s incredibly important to get some fresh air and stay active outdoors, we know how tough this can be in the middle of summer, and we know everyone could use a break from the summer weather, but options may be limited. It’s always racing weather! Whether it’s pouring rain or hot and humid outside, the temperatures inside an Autobahn facility are always ideal for racing. Air conditioning, no humidity, and never any rain! This is one summer activity you won’t have to rely on the weather for, giving you one less thing to worry about this summer. It’s affordable. Many other summer activities can be extremely expensive. If you go to a water park or theme park, you can expect to spend plenty of money on admission, food, drinks, and dozens of other things. Go-karting doesn’t break the bank. In fact, at Autobahn, we run plenty of specials each week and offer various packages to make it even more affordable for you this summer. Check out your location’s deals and packages here. It’s not over-crowded. If you go to a pool or beach this time of year, you can expect to fight big crowds. We work with our staff and racers to ensure you’re not waiting too long for your race and to make sure you’re entertained during the time you do have to wait. Many of our locations offer other amenities to keep you busy while you wait. Plus, you can watch other racers as you wait in order to pick up on some tricks and to watch other talented racers do their thing. There’s something for everyone. No, you don’t have to be a professional racecar driver to have fun go-karting. While we have some incredibly talented league racers at Autobahn, we pride ourselves on having some of the kindest, most helpful racers around. Even if you’re a first-timer who ends up on the track with a top racer, you can expect everyone to respect each other on the track — the top racers may even give you some pointers if you ask! Racing is meant to be fun (while competitive), so don’t worry if you’ve never raced before. You’ll get the hang of it in no time and be itching for more! It’s exciting. Let’s be honest… Other summer activities can grow old and become boring. Go-kart racing is exciting and different. Each time you go, you’ll be racing with different individuals and you’ll find yourself in different situations. Plus, the more you race, the better you’ll get, and the more you can challenge yourself. Set timed goals for yourself and see how long it takes you to break them! Bring your friends with you and bet on who the winner will be. That one turn that always slows you down each race? Make it a point to master it this summer! 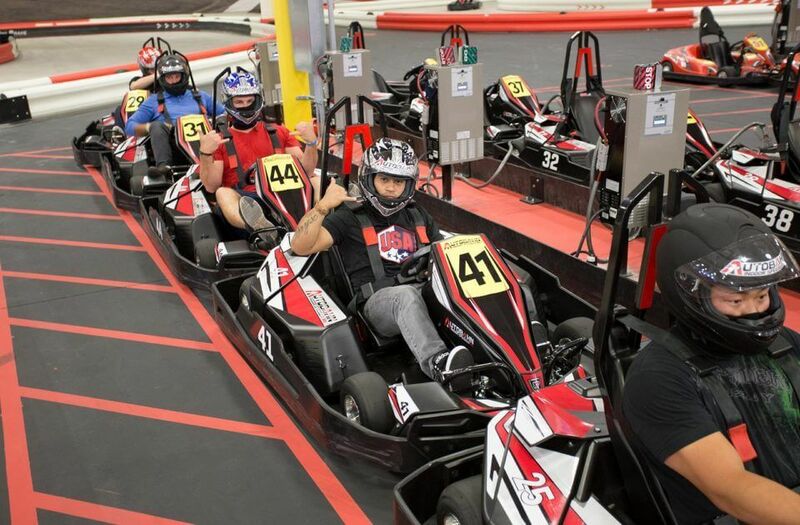 At Autobahn, our go-karts reach speeds up to 50 MPH, and there’s nothing quite like it. It’s everywhere! If you’re traveling this summer, no worries! We have plenty of locations across the U.S., and all of our packages are transferable. Check out our list of locations to see if there’s one close to your vacation spot. Now it’s time to enjoy your summer. If you’re looking for the best indoor summer activity, come race with us. You don’t even have to make reservations; just arrive and drive. We can’t wait to see you on the track this summer!